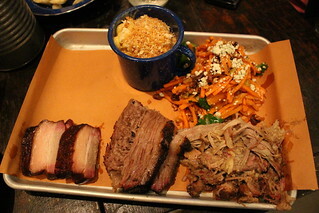 In the Fenway/Kenmore neighborhood of Boston is Sweet Cheeks Q, a barbecue joint from Top Chef finalist, Tiffani Faison. It's noted to be the most expensive bbq place in Boston, but possibly also the best. You can order meats by the pound or get a tray with 1, 2, or 3 meats (the last one is called the Fat Cheeks Tray) that comes with two sides. 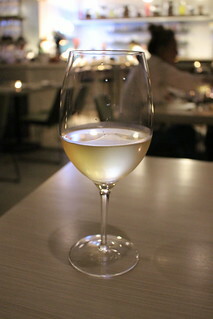 Above anything else, though, you have to - absolutely must - get the biscuits with honey butter. If you eat nothing else at this place, the biscuits need to be the one thing you do try. 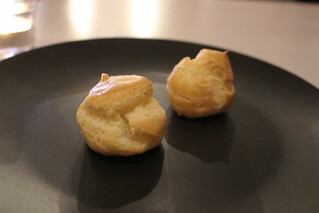 They are warm, buttery, flaky biscuits that are heavenly with that honey butter. 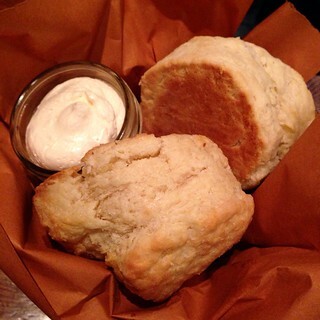 Oh, that honey butter ... No one will blame you if you just come here and eat a bucket of biscuits. 1. Bring breakfast or snack, or be sure to eat breakfast beforehand. You might think you want to come hungry to eat barbecue, but trust me, you won't be eating for a while (I got there at 9:25 AM and didn't eat until 2 PM!). 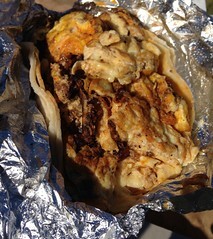 Me, I brought a breakfast taco from Cenote. 2. You can either be sure to get some or you can take a gamble. To be sure, get there early by 9 am and be prepared to wait up to 4 hours. Or you can take a gamble and stroll in around 12 or 1 pm. 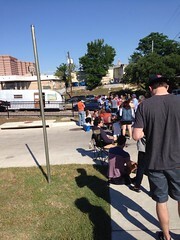 You'd only have to wait an hour or so and there's a chance there will be some brisket left for you (maybe even ribs). 3. When I was there, they had a guy renting chairs for $5. Remember, you might be there for 3-4 hours, though you can always sit on the ground. 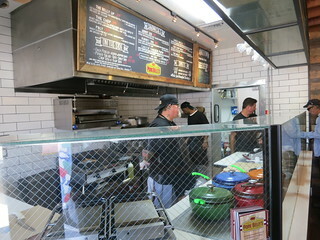 A couple doors down from a juice bar on Abbot Kinney is Pork Belly's, specializing in sandwiches made with meats smoked in-house by their competition BBQ pitmaster, Eric Solton. There's no seating inside this small store, but you can eat on the wooden counter on the wall of graffiti and they're working on some outdoor seating. 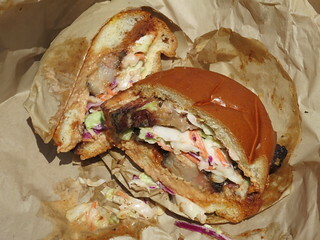 Generous amount of thick pork belly slices encased between brioche buns. It's decadent, for sure, but the slaw does a surprisingly nice job balancing the fattiness so that it's not too heavy on your palate. 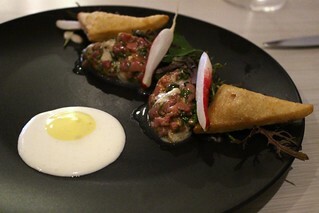 This is easier to eat than the pork belly. With the shredded brisket you don't need to tear off a chunk of meat with each bite. The sauce is nice, slightly tangy. Again, the slaw balanced out the sweet BBQ sauce nicely so you can keep eating. 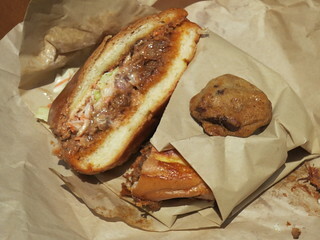 Oh, every sandwich also comes with a mini chocolate chip cookie, so watch out for it when you open the wrapper! The cookies are freshly baked and chewy. 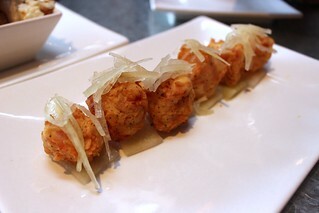 Smoky Balls: Pork & Beef meatballs smoked then thinly sliced. Served with homemade tomato sauce, peppers and onions on a grinder roll, topped with melted cheese ($8.95). 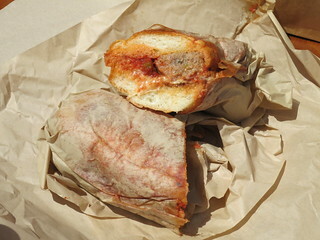 The meatball had a very interesting texture, closer to meatloaf than the usual meatball. 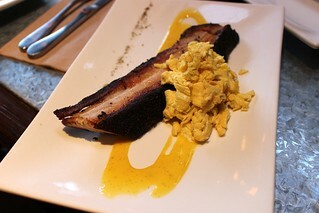 It's not as flavorful as the first two sandwiches but it had a subtle smokiness. Better than fries indeed! 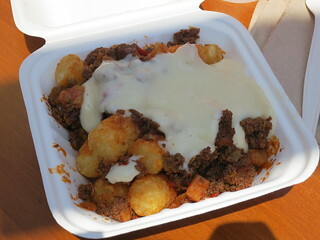 I only tried the slap tots but will need to try the one with brisket next. 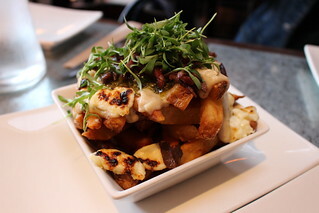 You can still take your vegetarian friends here, where they can try the veggie sloppy joe or a grilled cheese sandwich. 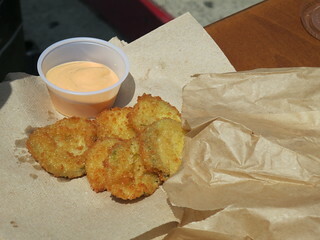 I think this is my first time having fried pickles but I really liked them, especially with that sriracha aioli. 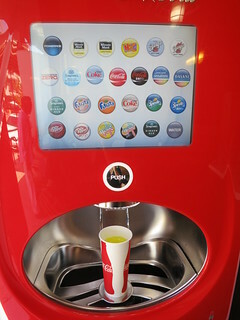 There's no beer or wine here, but I have to admit I did enjoy the freestyle Coke machine with over 100 choices of soft drinks or lemonade. So. many. choices. 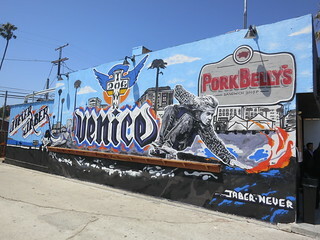 Pork Belly's offers something different in the Venice area and a quick, satisfying to-go lunch stop. To make it extra quick, you can also place your order online for pick up. On Mondays and Thursdays they have ribs after 1:30 pm but unfortunately I was there too early to try it. It's not just a lunch stop but they're also open late at night on the weekends (until 2 am on Fridays and Saturdays) and the food would be so good on those drunken nights and prevent hangovers!